Australia’s first under-the-stars dining experience, the iconic Sounds of Silence, is celebrating an incredible 25 years of operation this year, with a gala celebration being held this week (March 21, 2018). Upon opening its ‘doors’ in 1993 guests from all over the world immediately embraced the concept of dining in the middle of the Australian desert with magnificent views of Uluru and nothing but the vast expanse of the night sky above and has wowed guests every night since. “Sounds of Silence has been a key element to the Uluru experience for hundreds of thousands of guests to Ayers Rock Resort over the last 25 years,” said Voyages Executive General Manager – Sales, Marketing and Distribution, Ray Stone. 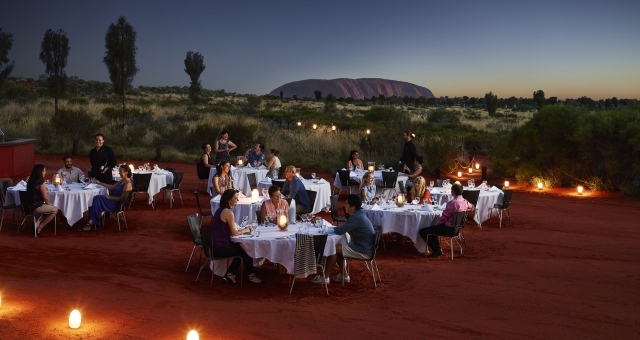 With such a winning formula, the experience has remained largely unchanged throughout the last 25 years – guests still arrive to the lyrical sound of the Didgeridoo and enjoy sparkling wine and canapes while viewing sunset over Uluru and Kata Tjuta, a star talk during dinner brings the night sky to life and telescopes are available for closer viewing. Australian ingredients have always featured on the menu and in celebration of the anniversary this year a new menu is being launched that will ensure Bush Tucker native Australian ingredients are featured throughout the many dishes on offer. Other extensions of the famous Sounds of Silence experience include the Night at Field of Light dining experience which includes a walk-though of the phenomenal Field of Light installation following dinner and the premium Tali Wiru and Mayu Wiru dinners which are limited to just 20 people per night. “Sounds of Silence has always been a celebration of the true essence of the Australian Outback, which is no doubt why it has been successful for so many years,” Stone said.